This week, the Canadian War Museum announced the acquisition of the ships wheel belonging to the World War I-era naval cruiser, the HMCS Niobe. The Niobe was scrapped in 1920, but the ships wheel ended up in the Camden Shipyard & Naval Museum. It was repatriated to Canada just this year. The photograph above recently came into our collection and initially we had some trouble identifying it. 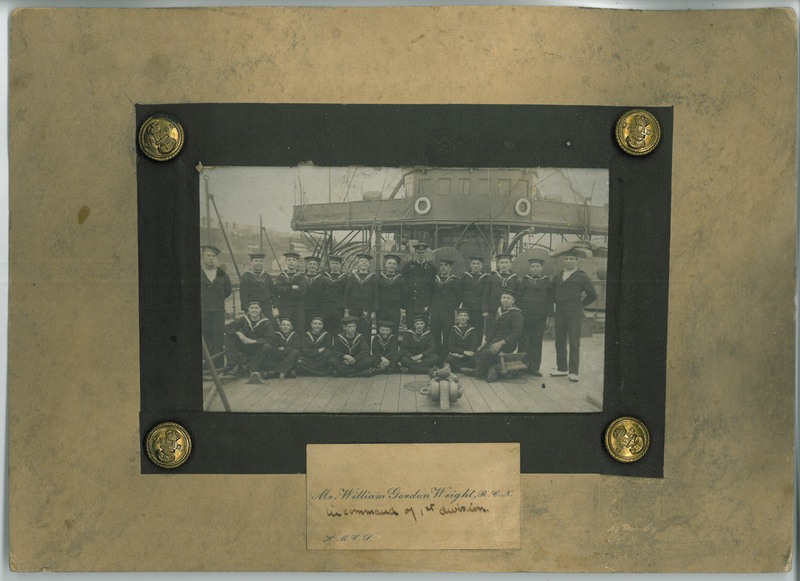 William Gordon Wright, the officer in the middle of the photo, was a member of the Royal Canadian Navy, but I still had to try to figure out the ship on which the photograph was taken. Using a jeweler’s loop, I was eventually able to distinguish the name of the ship on one of the sailor’s caps; HMCS Niobe. I wasn’t able to find out much about William Wright, he was an officer on the Niobe and likely joined the Royal Canadian Navy before the First World War. It’s not clear when this photograph was taken, given the age of the boys in the photo, this may even be a cadet troupe. The Niobe’s history, however, is slightly more well known. The Naval Service of Canada was founded in 1910 and the Niobe was one of two British cruisers that were sold to the Canadian government the same year, the other being the HMCS Rainbow. 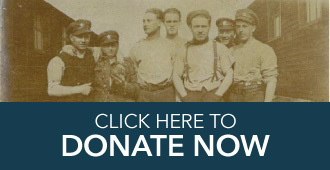 In the period before 1914 it was expected that the coming war would be primarily a naval one. The British Navy was the most powerful in the world and the German navy was quickly catching up, beginning the world-wide arms race that was one of the sparking incidents of the First World War. The Niobe was used in coastal patrols in Eastern Canada during the four years before the war. Since it was built in 1897 it was already outmoded by the time the Royal Navy sold it, and thus was very expensive to run. However, the war began and the Niobe continued to sail, serving actively until 1915 when it was docked for significant repairs. After it had been repaired, the ship was used in Halifax as a depot ship, providing support to large battleships and even submarines. The Niobe was in the Halifax harbour when the Mont Blanc and the Imo collided on 6 December 1917 and members of the crew tried to mount a rescue mission to sailors stranded on the Mont Blanc. Before they could reach it, the Mont Blanc exploded, killing the rescuers, civilians on shore, and flattening a large portion of Halifax. The Niobe was damaged in the explosion and spend several months docked for repairs. In 1920, the Niobe was sold and finally came to its end in the United States, where it was broken up for scrap. I don’t know if William Wright continued to serve with the Royal Canadian Navy or not, or if he continued his service into the Second World War. The RCN continued to grow slowly in the years between the wars; by 1939 it had 11 ships.